Maundy Thursday(Pesaha Vyazham) commemorates the institution of Holy Eucharist.Jesus Christ had his last supper with his disciples on this day.Maundy Thursday falls on the thursday before Easter.There were three important things remembered on this day.They are the institution of Eucharist(the bread and wine are consecrated and consumed),the washing of feet of disciples during last supper(to remind us to love and serve one another) and Jesus Christ betrayed by Judas and handed over to the Jews for crucifixion on Good Friday.On Maundy Thursday,all Christians go to church for the mass and in our churches,the mass is generally in the early mornings.This appam is unleavened and is steam cooked.It is served with jaggery coconut milk.Though I made this for Maundy Thursday but I know its late to post this recipe now(as Maundy Thursday and Easter got over last week).However,I would love to share the recipe so that it may be beneficial in future.This taste similar to idlis but with added coconut flavor and the paal(jaggery milk) makes best combo.Enjoy !! Wash and soak urad dal in water for 2 hours.After 2 hours,grind the urad dal with minimum(1/4 cup ) water to a smooth paste.Keep aside. 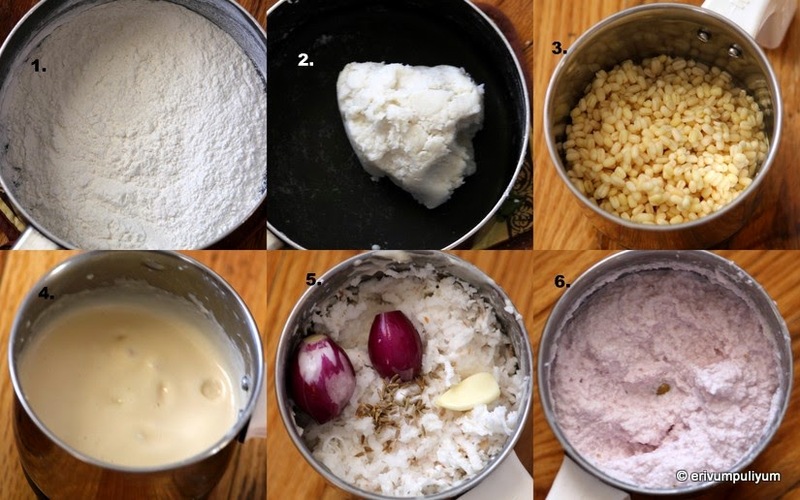 Add the ground urad dal in the dough and mix well with hands.Then,grind the coconut,cumin,garlic and shallots to a smooth paste,add this mix to the batter and using your hands combine everything well without lumps(The consistency of the batter should be of that of idli batter). Line a baking tin /plate with coconut oil /ghee.Transfer the batter to the baking tin(place a cross with palm leaves which we receive from church on Palm sunday) and cover the tin with aluminium foil(prevents water vapor from the lid from dribbling in the batter).Pour water in a steamer,let it come to boil.Place the baking tin/plate and steam cook for 30-40 minutes(keep the flame same throughout). Melt the jaggery with 1/4 cup water,strain the impurities and return to boil.Add medium thick coconut milk(2nd milk),keep stirring until the mixture thickens or half of it is evaporated.Mix the rice flour with water and add to the pan.Add the dry ginger powder and cardamom powder,mix well.Finally add the thick coconut milk(once bubble appears,switch off flame).The mixture thickens on cooling,so switch off flame accordingly. * If your batter turns lumpy after adding coconut and urad dal then run in a blender for few mins to get smooth batter.The consistency of the batter should be of that of idli batter. * The paal shouldn't be boiled over after thick coconut milk is added as it may curdle. Wow Julie ths looks so delicious. Iespecially loved the last picture must have tasted amazing. Wow, looks yummy! Nice recipe Julie.. This is awesome! SO meaningful too!